The Exclusive Winkler Damascus Belt Knife with Maple Handle is sold only through KnifeArt. 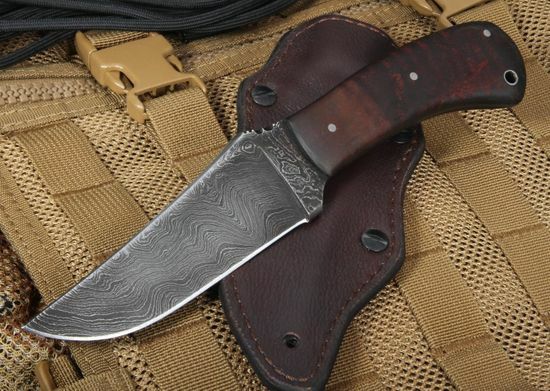 Designed by Daniel Winkler, a bladesmith since 1988 who draws his inspiration for his knife designs from the history of frontier America, the Belt Knife is an affordable and attractive fixed-blade knife that some may want as a collectible, but which can serve you more than ably, as well, as a knife for daily use Winkler has worked with Special Forces Teams in the U.S. Military and with Allied Forces from around the world. The Damascus Belt Knife with Maple Handle has a 4.5-inch blade made of hand-forged Damascus by Brad Vice. The thumb rest on the spine of the blade has been filed, ensuring a better grip. The total length of this knife is 9 inches and it weighs in at 5.9 ounces. The knife model was featured in the war movie "Zero Dark Thirty" several years ago. It includes a premium curly maple handle that has a full-tapered tang construction. Winkler understands the dynamic requirements users expect from a defensive fixed-blade knife, and upon picking this belt knife up, users should instantly feel comfortable with the handle's fit in their hands. Ordering from KnifeArt means your knife will ship within one business day of your order, and shipping is free. The Winkler Damascus Belt Knife comes with a guarantee of customer satisfaction as well as an easy return policy. I wanted to take the time thank Knife Art. They have an amazing selection of hand crafted knives. Shipping only took a few days. The packaging was well thought out. I not only got a sticker but also a patch with Velcro backing, very nice touch. This will not be the only Winkler II I buy and will not be the only time I shop at Knife Art. Thank you for your professional service and commitment to excellence. All I can do is echo the other reviewer's comments: this Damascus-maple knife is a true work of art, and the finest example of the knifemaker's craft that I've ever held. Fits my hand like it was made for it, perfectly balanced. Even the sheath is a work of art, showing the maker's attention to the smallest detail. All in all: Well worth the price! Knife Art got it to me fast: ordered on Friday, it arrived on Monday. Kudos to them for giving their customers the opportunity to own one of Winkler's Damascus masterpieces at a relatively low cost. Love this one, good-looking steel in one of my favourite fixed blade knife designs, very good ergonomics. The closest to a custom quality Polkowski/Kasper you will come today ;-) Handle very dark, as mentioned by the first reviewer. Thinking about sanding the coating off a little to see more of the nice maple. The sheath is great too, comfortable, sturdy, silent, very flexible carry options. I appreciate that you can take off the belt loops completely, just attach a paracord loop and tuck IWB/appendix for a very comfortable unobtrusive carry. Only problem might be, hard to clean the felt lining due to the permanently riveted sheath construction, so make sure your knife is clean before resheathing. Great service from Knifeart, as always extremely fast response and shipping. Own two other Winkler ll's. (Utility and F1-B Folder) Great knives. Always wanted a Belt Knife and I saw this one and since Daniel won't make you one ( I asked him) I waited until Knifeart had some more of their exclusive.I think it's the prettiest affordable fixed blade Daniel makes. The Damascus pattern is way better than the photos. Amazing. The fit, finish, materials and workmanship are nothing short of perfect. I read so much about how nice the belt knife is and it is all true. Feels perfect in the hand.. lightweight, incredibly sharp (no joke, be careful) and Daniel's leather/ Kydex/suede? sheaths are the best. The flame/curly maple grips are beautiful. You will NOT be disappointed. I purchased a Winkler Knives II Belt Knife with a damascus steel blade as a collectible knife, but, with the proper maintenance, it certainly could function as a fixed blade for daily use. Upon picking it up for the first time, I immediately felt comfortable with the knife, as the handle was an exquisite fit to my hand (I wear XL gloves), held in a sabre grip, and was light enough to bring to mind the frequently overused and incorrectly-applied phrase, “alive in the hand.” It was effortless to transition from a sabre grip to a reverse edge-out grip, which I attribute to Daniel Winkler's skill as a bladesmith and his understanding of the dynamic requirements of a defensive fixed blade. The curly maple scales, while smooth, provide a degree of texture that feels nearly velvety in my bare hand, while transmitting a type of warmth I do not get from more popular scale materials, such as G10 or glass-filled nylons. The damascus blade I received is similar to the photos on KnifeArt's Web page, with a grain flowing the length of the blade, but my blade is much darker than KnifeArt's photo, mostly black with dull silver grain lines, and it was shaving-sharp out of the box. It is very attractive and definitely different from other damascus pieces I have in my collection. In turn, the curly maple scales on my knife are quite dark, with just a hint of the red peeking out from between the dark chocolate brown tiger stripes the material is renowned for, and it is an excellent match for this overall dark knife. The knife has a strong metallic smell to it, even after a generous oiling, but I attribute that to the nature of its damascus steel. I was very impressed by the handsome leather grain of the sheath and its solid composition, but, while the sheath is described as kydex-lined, the kydex is sandwiched between the outer and inner leather layers. The inner layer is a soft, suede leather, so the knife should not be stored in its sheath to prevent unwelcomed rusting. Due to its size and weight, the Belt Knife would definitely be an excellent choice as a daily-carry blade or for the outdoorsman, but, as I mentioned earlier, perhaps someone intending on regularly carrying and using this knife should opt for Winkler's regular steel offering with a Caswell finish. This is a fantastic offering by Winkler Knives, and the service by KnifeArt was top-notch, as has been my regular experience with this company. I wish, however, that KnifeArt would throw in a patch or sticker with my purchases, to go with the price premium its knives command. I purchased a Winkler Knives II Belt Knife with a damascus steel blade as a collectible knife, but, with the proper maintenance, it certainly could function as a fixed blade for daily use. Upon picking it up for the first time, I immediately felt comfortable with the knife, as the handle was an exquisite fit to my hand (I wear XL gloves), held in a sabre grip, and was light enough to bring to mind the frequently overused and incorrectly-applied phrase, “alive in the hand.” It was effortless to transition from a sabre grip to a reverse edge-out grip, which I attribute to Daniel Winkler's skill as a bladesmith and his understanding of the dynamic requirements of a defensive fixed blade. The curly maple scales, while smooth, provide a degree of texture that feel nearly velvety in my bare hand, while transmitting a type of warmth I do not get from more popular scale materials, such as G10 or glass-filled nylons. The damascus blade I received is similar to the photos on KnifeArt's Web page, with a grain flowing the length of the blade, but my blade is much darker than KnifeArt's photo, mostly black with dull silver grain lines, and it was shaving-sharp out of the box. It is very attractive and definitely different from other damascus pieces I have in my collection. In turn, the curly maple scales on my knife are quite dark, with just a hint of the red peeking out from between the dark chocolate brown tiger stripes the material is renowned for, and it is an excellent match for this overall dark knife. The knife has a strong metallic smell to it, even after a generous oiling, but I attribute that to the nature of its damascus steel. 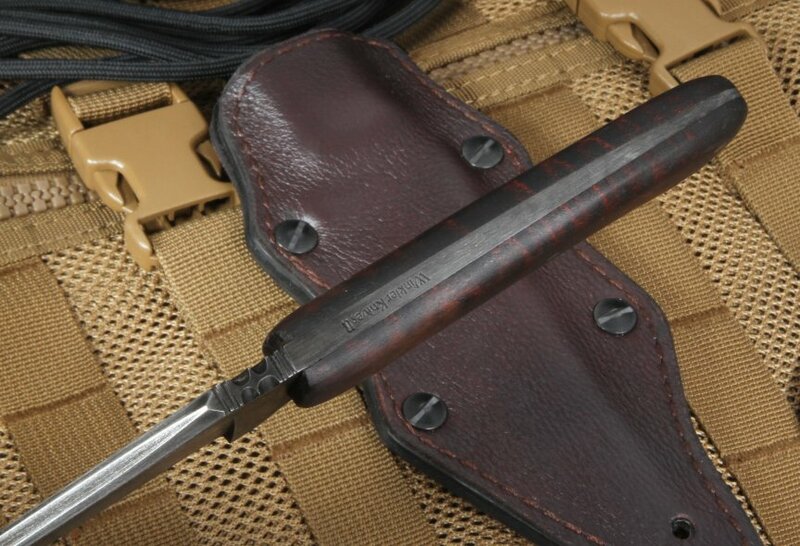 I was very impressed by the handsome leather grain of the sheath and its solid composition, but, while the sheath is described as kydex-lined, the kydex is sandwiched between the outer and inner leather layers. The inner layer is a soft, suede leather, so the knife should not be stored in its sheath to prevent unwelcomed rusting. 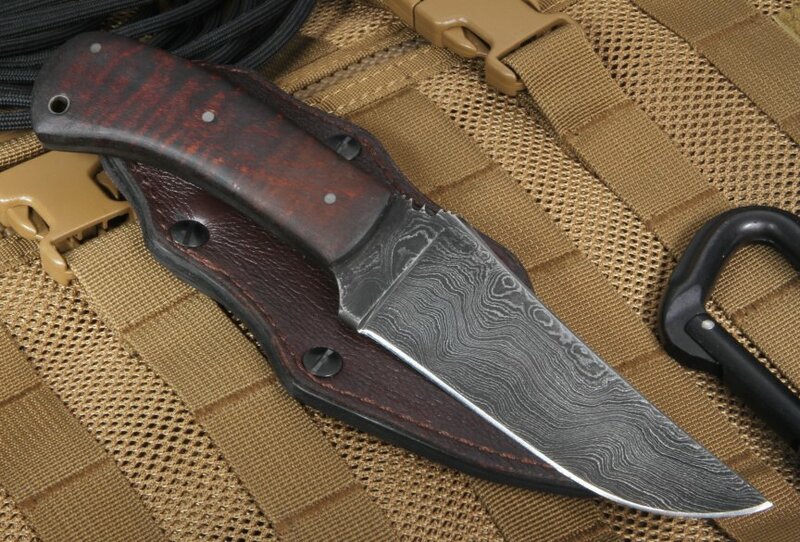 Due to its size and weight, the Belt Knife would definitely be an excellent choice as a daily-carry blade or for the outdoorsman, but, as I mentioned earlier, perhaps someone intending on regularly carrying and using this knife should opt for Winkler's regular steel offering with a Caswell finish. This is a fantastic offering by Winkler Knives, and the service by KnifeArt was top-notch, as has been my regular experience with this company. I wish, however, that KnifeArt would throw in a patch or sticker with my purchases, to go with the price premium its knives command. As a person who lives deep in the woods in Northern Michigan and Marine Corps combat veteran ret. I'd highly endorse this knive. Top of the line !!! Semper Fi.